A vandal smeared a controversial mural on the city’s southend. It’s crunch time for Hamtramck’s most controversial public mural. At Tuesday’s city council meeting, Economic & Community Development Director Jason Friedmann was given his marching orders: Either repair the paint-spotted mural or remove it. Guess what Friedmann is going to do? “I’m going to do what the council said,” he said. But really, what will he do? “I’m going to talk to some artists first,” he said. But if we were betting folks, it’s a good chance that Friedmann is leaning toward restoring the mural since he’s been a champion of this mural, as well as all public art. The mural, which is on the side of a city-owned loft development, is at Jos. Campau and Goodson. It has since been the center of controversy before the paint even dried. 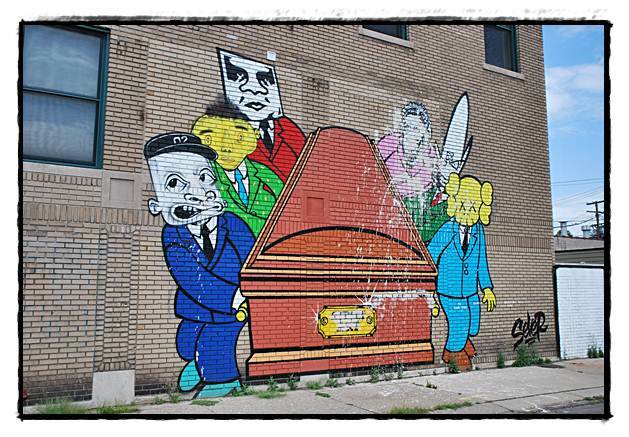 There are some in the community who object to the mural, painted by an internationally-known street artist who goes by the moniker of “Sever,” because it depicts six cartoon characters carrying a casket. A name plate on the casket says “STREET ART.” Apparently it is a statement by the artist who is saying that now that street art has gone legit, it’s over with. The first flash of anger about the mural came about in May when someone at night — a witness said one or two women — scrawled “This is not my city” next to the mural. The witness said the women then went into New Dodge Lounge, which is located just a couple of storefronts down from the mural. The witness could not identify the women to police because they melted into the crowd. That graffiti was taken care of. The mural was part of several other public murals that were painted by a number of national and international street artists, all sponsored by a paint company. Friedmann said the murals have attracted a number of visitors and groups of bicyclists on organized tours of the metro area. Assuming Friedmann does repair the mural, the next question is: Will someone continue to vandalize it? Friedmann said he is considering installing a security camera system on the building since it is a city-owned building and it is standing vacant.